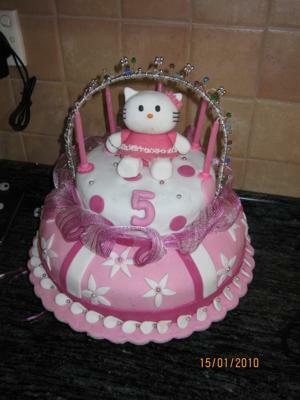 For this Hello Kitty cake, I started by doing the Hello Kitty figure a week before to let it set and harden. I used white modeling paste, which it is basically made from sugar paste and gum tragacanth. The dress and the flowers were also made from the same medium. To make the whiskers I used pastillage, made from, egg white, icing sugar, gum tragacanth and added some black coloring to it. As for the cake I used 2 chocolate cakes, one 23cm for the base and an 18cm one for the top. Both cakes were filled and covered in chocolate cream. I lightly spread some cream on the cake board so that the cake will stuck and stay in place. I have than covered at the same time the cake and the board with pink sugar paste, added some strips in different colors and some hand cut flowers. Again I placed some cream on the middle of the cake to get the small cake stuck with the bottom one. This cake was covered with white sugar paste to achieve a color contrast and added some decorations to it. I finished the cake by placing the Hello Kitty and the tiara which I made for the birthday girl to wear before she cut the cake. Hi Pricilla, couldn't stop to post my comment, as a Maltese I feel happy to see other Maltese members submit their cakes here. I have to tell you what a nice job you did. Keep up the good work. Hope to see more work of you here.